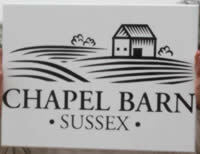 The Sign Maker for the very best in Bespoke Signs and Memorials - Beautiful house name signs made just the way you want them. 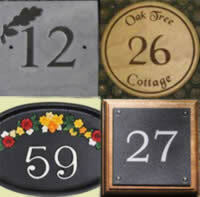 From our North Devon workshops we make all kinds of house signs, house name plates, home name signs and door numbers. 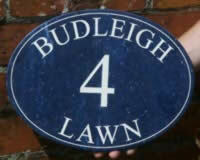 Each house sign is individual - personalised to your requirements. You choose the material, the size, the style of lettering as well as an image, should you want one. We have lots of different techniques we use when making the house signs depending on your choice of material. These include Sand-Blasting, Engraving, Lasering, Printing, Casting & Painted. You tell us exactly how you want your home sign to look. 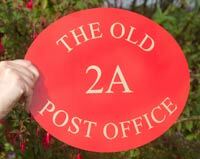 If your are not sure of how you would like your house sign or house name plate to look and are in need of inspiration, have a quick look at this page first. It contains lots of photos of house signs and home name plates we have made for our customers. We have included details about each sign including fonts and materials used. Just click on the photos for more information. We have included signs from all the ranges to help you make your choice. 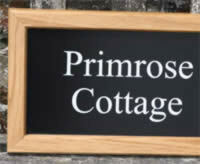 We make our slate house signs to suit you. You can have any size you want. Letter size is not fixed and is adjusted to suit the sign. There are hundred of fonts and lots of letter colours. White or silver are the most popular. We also make bespoke slate signs to any size and can use images and borders from our library. The painted wood signs are very beautiful and look perfect in a modern or traditional setting. They can be single sided or double sided and can be supplied with stainless steel or wrought iron hanging fittings if required. Hanging brackets also available. Can be painted white, black, grey, green as well as many of the Farrow and Ball colours. These are very popular at the moment. 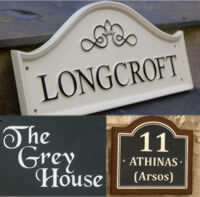 A range of polished granite, marble and quartz house name plates. Lots of lovely colours created in many sizes. Pictures can be included if required. Can also be etched into the polished granite without painting the letters. Corian is an amazing material for house signs. It looks and feels like stone but has none of the imperfections you find in natural stone. The lettering can be smaller, images with finer detail can be used and it is less likely to crack or chip. For more impact it can be placed on a backing board or put into an oak frame. Corian house signs can be cut to most simple shapes. We have door number signs in all the materials we use in our workshops - wooden, slate, marble, granite, engraved brass, engraved laminate, enamel, cast brass and aluminium and even vinyl lettering to go in a glass window. There is, without doubt, a number to suit your home. A simple aluminium composite board can be transformed into a beautiful sign with an oak frame made by our in-house carpenters. We can also make them double sided for hanging signs. The frame can be treated with oil, painted black or white. We also have painted framed house signs - these are made using long last wood based trocoya board with a painted oak fram & painted letters. 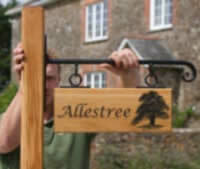 Stylish hanging house signs made in solid wood or oak framed aluminium composite. These can be attached to hand-made wrought iron brackets and supplied with or without a posts. The framed signs come in a number of colours with black or natural oak frames. The wooden signs can be Oak, Cedar or Iroko. Over the last couple of years simple the black and white house sign has become very popular. 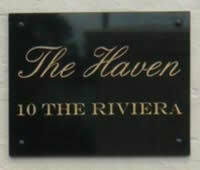 We have therefore created a page to show the various alternatives available to you for a black and white sign. A range of painted metal home name signs, durable screen printed stainless steel name plates and metal signs with raised letters - all hard wearing and low maintenance. 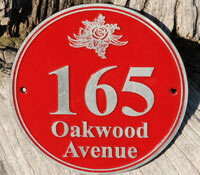 Includes gate signs, ovals, arch tops and a lovely range of French Style name plates. Many of this range can include your own computer graphic or hand painted image. These signs are cast in one piece using a very high quality polyurethane. This is an extremely tough hard wearing material which is solid, rigid and does not corrode.It has a distinct advantage over cast metal in that the lettering is crisper and the motifs, logos and crests can be much more intricate. These are ideal for the modern home. The lettering is applied to the back of the clear glass like acrylic sign. This is then held away from the wall with aluminium or stainless steel stand aways. The lettering can be in any colour and we can include a sand-blast effect backing vinyl if required. Also available in full colour and in larger sizes for business. A house sign which is excellent value for money as well as being low maintenance and long lasting. They are made from aluminium composite - a very smart material which is light weight, rigid and durable They are available in a range of sizes, shapes and colours. The tough vinyl lettering is also available in many colours. It can even be reflective. These vintage style signs and name plates are gorgeous. They are made using traditional methods developed over the last 120 years. Some of the dies for the embossing process are 80 years old! Each plate is hand made and then hand sprayed using stoving enamel. Excellent value name plates. There are a whole range of house signs with posts. These can be made in various timbers which can be natural or painted in many lovely colours. Full colour printed aluminium panels can also be framed in oak and mounted onto posts. Another option is to engrave a corian panel, inlay it into oak and thenmortice the sign into posts. for a cheaper option we can front fix a painted tricoya board onto posts. The celtic designs can be made in most of the materials we use. Using lovely Celtic fonts along with beautiful borders and symbols, our designers will create a design, totally unique to you. Once you are happy with the layout, it is passed over to our craftsmen who will make your celtic style house sign. There are 3 thickness of top quality engravers brass available along with coloured aluminium , stainless steel and acrylic laminate for tarnish free plaques. As with all our name plates you are not limited to a few styles. The materials can be cut to any size, there is a wide range of engraving fonts and graphics which can be used to create a unique design.